The genius of the Left Behind series is the way it combines Roland Emmerich-style disasters with its Biblical lectures. And the new movie version even stars Nicolas Cage. So it's too bad this new movie fails on the "disaster epic" front, because it's too busy torturing its incredibly clueless characters. In case you missed it somehow, the basic concept of Left Behind is that the Rapture happens, and millions of devout Christians (and all the little kids) are taken to Heaven, leaving their clothes and stuff behind. For the people stuck on Earth, this is the beginning of seven years of tribulation, leading to the end of the world. This Left Behind reboot is clearly intended to appeal to a slightly more mainstream audience than the beloved old Kirk Cameron film. This time around, we've got a cast of real actors, including Cage, Chad Michael Murray, and Lea Thompson. 1) If it was a gonzo, over-the-top crazypalooza kind of thing, which is what you might have expected when they cast Nic Cage in the lead role. Sadly, the film is actually pretty restrained for the most part, and Cage keeps it together except for one bit where he says, "Am I crazy, or did the world just go insane?" Also, there's a scene where everybody on the airplane thinks the Muslim character has a weapon, and it turns out to be just an electric toothbrush — and for one beautiful moment, the Muslim dude winds up menacing Rollo from The Cape with his electric toothbrush. But other than those bits, it's mostly tragically low-key, and depressed. 2) If it was a straight-up disaster movie, along the lines of 2012, with some sermonizing sneaked in. And here's where the movie really runs into trouble. We definitely go through the motions of the typical disaster-flick — Cage is Rayford Steele, an airline pilot whose plane is over the Atlantic when the Rapture happens, and he struggles to land his plane safely with the help of ace reporter Buck Williams (Murray). Some of the stuff involving trying to save these passengers is reasonably well done, with good attention to aviation details. Meanwhile, Cage's daughter, played by Cassi Thomson (Big Love), is stuck on Earth, as everything unravels. But here's the problem — this movie sort of wants to be an exciting disaster epic, but its heart is all in the sorrowful melodrama. Every scene in this film goes on for another 10 minutes after you think it ought to be over, and dire soap-opera muzak warbles over every single moment of anguish and confusion. As if you need a constant reminder that everybody is REALLY REALLY SAD. And meanwhile, this movie lingers over the confusion of the people who were left on Earth (or on an airplane). It takes forever for anybody to start groping their way towards the truth about what's happened, and meanwhile they toy with ideas like: Maybe these people are all just hiding somewhere? Maybe it was terrorists? Or the military? The Asian alien-conspiracy nut thinks it was aliens. One crazy lady thinks it was all orchestrated by her ex-husband. Maybe all the people are still here, but they've turned invisible? Maybe they all went to the same hospital, and we can find them there? It's like watching people walk into walls over and over, after a while. The film's pacing is so slow, it can't just be a matter of weird editing — it feels like the movie is purposely dwelling on every bit of anguish and mystification on the part of the unbelievers, at great length. Because eventually, when they realize what's actually happened, we get to what this movie clearly thinks is the good part: the people who are "left behind" blame themselves, and they wish that they'd only listened to the religious people in their lives, when those people tried to convert them. So Left Behind is sort of a wish-fulfillment fantasy for its core audience, in other words. Not just the notion that if the devoutest Christians vanished, the world would instantly fall apart (like, from "normal" to "Mad Max" in a few minutes.) But also the fantasy of having the non-believers in your life finally realize that you were right all along, except that now it's too damn late. The person who carries all of this on her shoulders is Lea Thompson, who plays Irene Steele, the Christian wife of Nic Cage's character. Irene has converted to Christianity in the last year or so, but her attempts to talk about her new faith to her philandering husband Rayford have fallen on deaf ears. And meanwhile Irene's daughter Chloe calls her a "wacko," because whenever she sees an earthquake on CNN, Irene thinks it's another sign of the End Times. 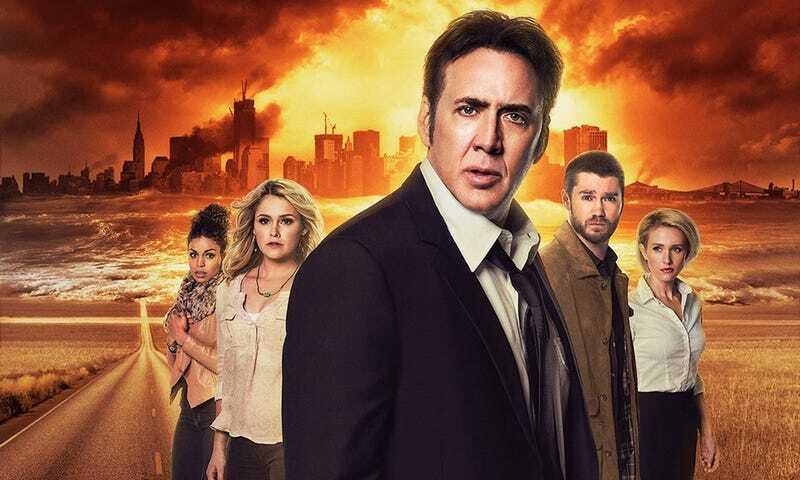 Even with Nic Cage dialed back massively to within a normal human range of expression, you can imagine how hard Cage can sell his feelings of remorse and self-recrimination while he's also in the middle of crashing an airplane. There are a few effective scenes in the film, for sure — Chloe's disappointment with her dad's womanizing and mistreatment of Irene is understated, and somewhat poignant. Also, the one scene where Chloe meets her mom's pastor, who didn't get Raptured because he didn't really believe his own sermons, is legit great: He tells her that she needs to listen to him, and she responds, "Why? You didn't even listen to you." Left Behind 2014 has all the makings of an entertaining survival movie. There's absolutely nothing wrong with Nic Cage trying to land a plane in the midst of the Great Tribulation. And this film could have done a lot with the post-Rapture chaos in the city, even on a shoestring budget. Nor is there anything wrong with people realizing that they need to repent and embrace Jesus, since that's the whole point here. You sort of expect a post-Rapture movie to include lots of scenes where people are told that it's not too late to turn to God, and that He still loves them, etc. — it's part and parcel of the genre, and those sorts of scenes can be very effective and moving. But this film just takes way too much pleasure in watching its characters stumble around in near-endless torment and disorientation, and it gets bogged down in the voyeuristic misery. In the end, this movie's payoff isn't that these people can still be saved if they open their hearts — it's that they realize that Marty McFly's mom was right and they were wrong, and they really shouldn't have been so mean to her.